Vacuum Pump applied in Vacuum Drying of Transformer - Vacuum Pump - EVP Vacuum Solution! 1. Vacuum drying. Put the body of the oil-immersed transformer into vacuum tank . In order to remove moisture and moisture from insulating materials faster and more thoroughly. 2. Vacuum oiling. it will suction air after transformer body assembly is completed and then injected into the transformer oil. the purpose is to transformer oil moisture, moisture, air as much as possible overflow. Prevent moisture or bubbles from adversely affecting insulation. 3.Vacuum casting. It is a dry-type transformer process, to prevent the transformer vacuum tank pouring epoxy resin, similar to vacuum oiling, it also remove the air and moisture in the epoxy resin to prevent the formation of bubbles in the coil or cavity to provide the insulation properties of the coil. Here we mainly discuss the vacuum drying of transformer. Transformer body are almost all made of insulating materialin except iron core and the wire , which usually contains 6-8% of water. the insulating material will be further damp and the transformer contained in the insulating material contained in the water under the action of a high electric field will produce a free discharge and gradually lose its proper insulation properties when assembling. On the other hand, if the moisture content of the transformer exceeds a certain limit during the operation of the transformer, the degradation rate of the fiber of the insulation material will be significantly accelerated and the aging of the material will be accelerated. Therefore, the assembly of a good transformer body immersed in transformer oil, transformer insulation should be removed moisture. (1) heating the transformer. Each time the temperature of insulating material is increased by 20 ℃, the internal water vapor partial pressure will be doubled. (2) Suction air to transformer, that is to reduce the insulation to the external space water vapor partial pressure. 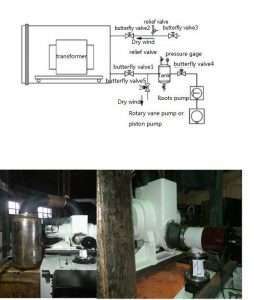 Therefore, the vacuum pump is required for transformer. Vacuum pump as the key equipment for vacuum drying, the type of vacuum pump should be selected to consider whether it is suitable for on-site production process requirements. Power transformer drying process is actually a dehumidification process, pumping a large number of water vapor discharge, so the choice of the former stage pump to withstand relatively high partial pressure of water vapor, such as the use of rotary vane pump, vacuum pump or water ring valve Pump. However, the general large-scale power transformers (voltage level above 110KV) is the vacuum tube vacuum drying system requirements of the ultimate vacuum at 10pa, water ring pump with a Roots pump are far less than this requirement (not to mention the system should also be considered leaks ). EVP rotary vane pump ultimate vacuum up to 10pa (piston vacuum pump can reach 1pa), coupled with a Roots pump, the vacuum can be referred to at least 10pa (consider the system leak rate within 10h does not rise in pressure Greater than 93pa). Therefore, transformer vacuum drying equipment now tend to use rotary vane vacuum pump or piston vacuum pump as a backing pump. At the same time, the exhaust medium mixed with a lot of water, should be installed filter device.